It's not a sentiment you'll see on an inspirational poster anytime soon: When facing a problem, sheer persistence is not enough. At least, not if you're a hyena. Presented with a latched box holding a hunk of meat, wild hyenas tried hard to extract the food. Their success depended on their fearlessness and the number of different strategies they tried, but not on hard work. Spotted hyenas (Crocuta crocuta) are hardy and adaptable animals. They're resourceful hunters, taking down prey alone or in groups, and they navigate complex social situations among their clans. They're the most common large carnivore in sub-Saharan Africa. To study the animals' problem-solving skills, Michigan State University graduate student Sarah Benson-Amram challenged a wild population of spotted hyenas with a meat-filled puzzle. For a year, Benson-Amram drove through Kenya's Masai Mara National Reserve administering pop quizzes to hyenas. Whenever she spotted a subject, she stopped the car and deposited a box made of steel bars on the ground. Then she pulled away, parked, and watched what happened. Hyenas that approached the box could see (and smell) a tantalizing, two-kilogram piece of raw meat inside. The box had handles on the sides that let hyenas drag it or flip it over. But the key was to find a bolt that slid sideways, releasing a swinging door and letting the hyena at the prize. Sixty-two hyenas participated ("volunteered" would be overstating it) in the study. The individuals could be told apart by their spot patterns and other distinctive features. Some only took the test once, while others that crossed Benson-Amram's path more often ended up becoming repeat subjects. 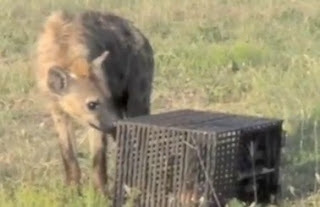 Hyenas were scored on how long they waited to approach the box, how long they spent trying to open it, and how many different behaviors they tried—including investigating, biting, digging, flipping the box over, and pushing or pulling it. They were also scored, of course, on whether they ever got the darn thing open. The hyenas that aced the test weren't more likely to be young or old, female or male, or of a certain social status. But they did differ from flunking hyenas in factors that might be called personality traits. According to a paper published last week in Proceedings of the Royal Society B, two traits helped hyenas solve the puzzle. The first was not being afraid of new things. Benson-Amram scored the animals' "neophobia" based on how long they spent near the box before they touched it. Hyenas that were more fearful were less likely to get the box open in the end. The second factor that helped them open the box was how many different behaviors they tried. Hyenas that had more ideas about approaching the puzzle—biting the latch, turning the box over, pushing it with their paws—were more likely to find the solution. Persistence didn't hurt. Animals that gave up quickly didn't succeed. But animals that spent more time working on the box didn't do significantly better. Even though hyenas that failed the test spent an average of almost four and a half minutes trying to open the box the first time they saw it, if they didn't have enough ideas about approaching the puzzle, they wouldn't get the meat. Benson-Amram says that in the field of animal behavior, "personality" describes how an animal behaves across a range of situations. Since she only tested hyenas in one situation, she can't speak to their personalities in general. Still, boldness and creativity clearly helped hyenas open the puzzle box. "On this task, that personality trait was helpful," Benson-Amram says. Innovative thinking and fearlessness, the keys to solving the puzzle, showed up more often in young hyenas. Juveniles didn't outdo adults in getting the meat out of the box, maybe because the heavy puzzle was harder for them to maneuver. But in different circumstances, younger hyenas might have been the best problem solvers. "Hyenas constantly have to innovate solutions to new problems in order to deal with the highly varied challenges in their environment," Benson-Amram says. "They take down zebras that could kill them with a strong kick and they compete with lions for resources." Trying a variety of approaches when they face a new challenge might help hyenas survive, just as it helped some of them pass her test. The same tactic might help humans find solutions too. In studies of human infants, Benson-Amram notes, researchers have found that babies who use a wider range of behaviors when facing a new problem are more likely to solve it. Creative thinking might be the trait that lets humans adapt to our own landscape and confront the problems that, like the steel box, appear inexplicably in our paths. Image: Still frame from a video of a hyena opening the puzzle box, from Sarah Benson-Amram and Kay E. Holekamp.